Household chores is serious business. It can never be done alone especially if the rest of the family members do not participate in keeping the house tidy and orderly. Maintaining a home requires constant care, dedication, and love. Cleaning is more enjoyable if there's teamwork. There's this unexplained feeling of satisfaction from a clean house: replaced bed sheets, shiny floors, ceilings removed of cobwebs, dusted appliances and cabinets, scrubbed bathroom tiles, but my favorite part of the house is the kitchen with cabinets that are orderly, free of pests and, most of all- washed dishes. Rewarding yourself after a hard day's work by eating sumptuous food is the best part of the day and once full, everybody might get lazy to clean up. It helps if the right tools are used to make the chore easier and it feels better if done efficiently and more economical. However, no matter how simplified the job is, the dishes don't wash by themselves, so the question is "Who is going to do the dishes". Here's an article I recently read--Dishwashing causes more relationship distress than any other household task. A study supports that it’s more important to share the responsibility of doing the dishes than any other chore. What's with this task that affects relationships? Have you ever noticed that the most unpopular household chores is associated with women? Chores that people find undesirable and involved with cleaning up after someone else like cleaning the toilet, doing the laundry and washing the dishes tends to be women's full responsibility while men do tasks not associated with gettting hands dirty such as washing the car, or taking out the trash. Let's face it, doing dishes is gross and once done does not get you compliments such as "What a squeaky-clean piece of China!" unlike when you cook delicious food or did well in gardening. Personally, and it may sound unusual to some, it's a task I enjoy the most. All I need is running water from the sink, a big non-scratch scrub sponge, and a reliable dish washing liquid. 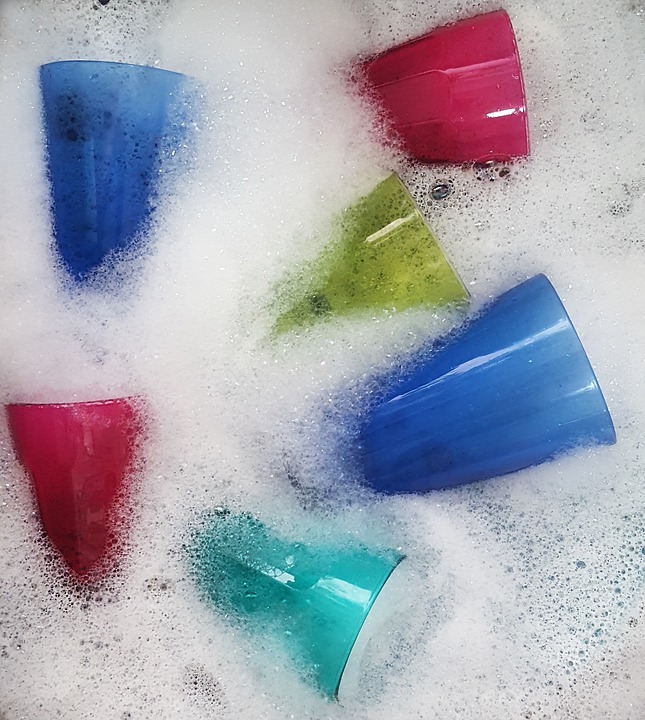 Over the decades, solutions for dish washing has improved. I remember vividly how I finished the dishes using laundry bar that's tough to rinse. Dish washing paste is great, leaving a great scent as well but I needed an economical approach. I've tried different ones but I've stuck with Bubble Man just recently. The name says it all, more bubbles equates to more dishes cleaned. Scents come in three variants too and the Anti-bac is my pick although I bought the rest of them to try it all. Purchasing their bigger bottles saves me more money in the long run! Bubble Man is easy to rinse, no grease left, no bad smell but just a scent I love, and no repeats. Guess what, it's an all-around cleaner too. It's for washing rugs, cleaning the kitchen counters, cleaning windows, mopping the floor, cleaning the bathroom, washing the walls, cleaning your kids' toys, and since it's gentle on the hands then it's safe for washing the car too. Finding this dish washing liquid slash all-around cleaner is one great find. It's high time to break the mold that only women should do the dirty chores. For the males, doing tasks like washing the dishes is a great way to show women that they're appreciated and that we're equals. It is a task that can also be shared: She rinses while you dry it. This specific chore is better if done as a team, it requires two people to stand side by side and work harmoniously to accomplish it. If done more often, couples will feel connected to each other.